'New' – Economics Of Citizen Preparedness: Should Government Officials More Openly Acknowledge Its Readiness Messaging Is Financially, Socially Tiered? 'New' – Emergency Managers Say Twitter & Facebook Being Used Differently â€” Twit: More â€œInformational,â€ Speed, Official Audience; FB: More â€œEmotional,â€ Community-Building, Public Discussion/Feedback. 'New' – More Than 600,000 Japanese Citizens Participated In Their Nationâ€™s Annual Disaster Preparedness Drills â€” Why Isnâ€™t There A Day When Americans Do The Same? 'New' — Is The Level Of Public Knowledge The Weak Link In Governmental â€˜Dirty Bombâ€™ Preparedness? 'New' — Officials Shouldnâ€™t Be Afraid Of â€œFearâ€ In Effort To (Responsibly & Constructively) Inform, Engage & Prepare Public On Terror Threats; Itâ€™s Used For Hurricanes & Global Warming, Why Not Terrorism? 'New' — Preparedness Advisor Says Virginia 3rd Annual Tax Free Supplies Holiday Starting Today Has Been â€˜Win-Win-Winâ€™ Success For Govt./Business/Public â€” Question Is Whatâ€™s Keeping Other States, Feds From Trying Similar Incentives? 'New' — Tax-Free Preparedness Supplies Bill, Suggested By The Blog, Under Consideration By NY State Legislature To Mark 9/11, Katrina Anniversaries. Why Arenâ€™t Other States Considering It? In Order To Make Family Emergency Planning More Effective (& Credible), Should It Be Done Together With Schools, Businesses, Neighbors, Responders? Maybe On A Specific Day? "What Should We Tell The Public?" 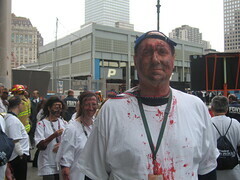 On Sunday, I participated in “Operation Safe PATH 2009,” the largest terrorism drill in New York City since 9/11. I was one of approximately 150 Community Emergency Response Team (CERT) members who played bombing ‘victims’ for the exercise. 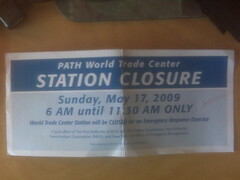 I am standing outside the PATH train station near the site of World Trade Center along with other CERT “victims”. The New York City Office of Emergency Management (OEM) and Port Authority of New York and New Jersey hosted the full-scale, multi-agency two-hour exercise to test the City’s and the Port Authority’s response to an Improvised Explosive Device (IED) detonation on a New Jersey-bound Port Authority Trans-Hudson (PATH) train. 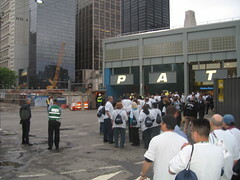 More than 800 emergency responders participated in the simulated response to two explosions on a train in one of the PATH tunnels between the World Trade Center and Exchange Place Station in New Jersey.Â The exercise focused on the integration of PANYNJ and New York City assets and tested the decision making necessary to save lives and protect the public. Specifically, the exercise tested on-site incident management, search and rescue, mass casualty medical support, intelligence and investigation, and tactical interoperable communication.Â The drill was modeled after the July 2005 subway bombings in London. 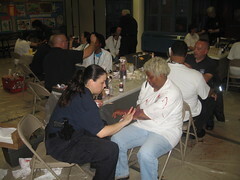 The volunteer ‘victims’ in the drill were CERT members from throughout New York. Last Monday, there was a three-hour “Actors Briefing” in which OEM, fire and police officials gave us an overview of the exercise as well as the do’s and dont’s for volunteers in an emergency drill. We were asked to report to a school near the train station at 5:00am, three hours before the scheduled start of the exercise. After a short briefing from our drill “Controllers”, we were given our official plain white t-shirts, divided into groups and provided “moulage” by makeup artists with varying levels of wounds. I had a pretty severe looking one: a major cut to my forehead caused by piece of glass — which was attached to my face — along with a lot of imitation blood and grime. CERT members have “moulage” applied to them with varying wounds before the exercise started. (There were a lot of memorable images from the day for me, but one of them is definitely having make up applied by a man with a gun.) Earplugs and a light sticks were handed out in case we needed it in the tunnel.Â We were also given a card with our victim profile with details on our “condition” for the role we were playing. These were worn around our neck so the responders could see what our situation was. However, my role was changed before the exercise started. So instead of a 3-year-old girl with 1st degree burns, I became a 45-year-old bleeding man with a piece of glass in his forehead. Each of us received a card with our ‘victim profile’. The CERT team members then all left the school and walked a couple of blocks south towards the World Trade Center site and the PATH train station so we could get into position. All the CERT members lining up to go down inside the train tunnel for the drill. We were led by our controllers through the station turnstiles and down into one of the track tunnels. We walked about 200 yards or so on the tracks before going into a small enclosure underneath where Tower 1 of the Trade Center once stood. Our job would be simulatingÂ passengers coming off the front of the train after a bomb had exploded. (There were train cars farther into the tunnel where other CERTs were). We waited just off the tracks until the actual exercise began, and the makeup artists dropped in and freshened up our “injuries”. At just about 8:00 the walkie talkies of our controllers indicated that the drill had begun; soon after, we saw the first wave of heavily-garbed emergency responders heading past us towards the train. After the train ‘explosions’ we watched as the initial emergency responders in special Hazmat suits walked past us on the tracks and towards the incident. We were then instructed to begin our self-evacuation back up the tracks as simulated smoke was being pumped into the tunnel. Those of us with green tags could walk on their own, while others with yellow tags needed assistance. My CERT team colleague Will Sanchez (one of six volunteers there from my ESNA-CERT team) and I helped carry a woman with a yellow tag along the tracks until rescue workers with stretchers took her the rest of the way. Firefighters roll CERT victims down the track back to the station. As we continued on down the tracks other firefighters responding to the scene would stop us, check our tags to see our condition, and ask if we needed help ourselves (which we declined, according to our role). When we climbed up off the tracks and got to station level, the scene was filled with hundreds of uniformed officers from various places. We were directed to a group of paramedics (who asked how we were and then put a tag with our name and condition around our neck) and police detectives who asked us questions about the incident (”How many explosions did you hear?” “Did you see anyone suspicious beforehand?”). Then, we were escorted up Â and out of the station to a nearby Post Office garage where paramedics did a final check and a numbers count. After the exercise was completed, the CERT victims all returned to the School for a wrap-up discussion with OEM Commissioner Joseph Bruno and our controllers from the Fire Department. 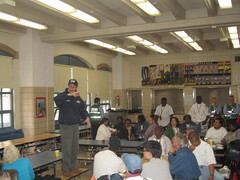 OEM Commissioner Joseph Bruno speaks to CERT members after the drill has been completed. From our perspective as victims, it is difficult for the CERT members to know how successful “Operation Safe PATH 2009″ was for the responders. That will be determined by the authorities in post-exercise analysis in the weeks to come. Though one lesson wasÂ already learned before the drill began: after the Air Force One photo fly-over frightened residents of lower Manhattan, the government agencies involved bought television and radio ads and put up posters in the train station and around the neighborhood warning about the drill. A flier distributed to PATH riders and neighborhood residents last week announcing the emergency drill. 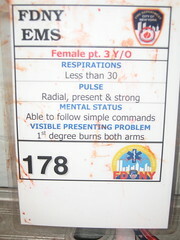 I had participated as a victim in two other major emergency drills — a hurricane exercise held in downtown Brooklyn in 2006 called “Hurrex”, and “Operation Civil Support” which included a simulated bus explosion, a building collapse and a chemical attack in the subway held at the Fire Academy on Randalls Island in 2008. Like those drills, this was a fascinating experience. Being involved helps CERT members better understand the role of responders and citizens in emergencies, and makes us more effective in our communities both before and during emergency situations. One of the major reasons for these exercises is to allow the responders from different agencies to meet each other before the â€˜real thing’. (”You shouldn’t be handing out business cards at the scene of a disaster” is a common refrain I’ve heard.) I believe it is similarly important for CERT members, particularly those from nearby areas, to forge relationships in advance as well. And we did yesterday.Â The agencies involved deserve credit for including CERT in this major exercise. I hope that we were a helpful part of the exercise and will continue to have opportunities to participate in these drills in the future. We were told that this drill was the most extensive involvement by CERT thus far and that our work as victims makes it more realistic and helpful for emergency responders.